The Department of Health and Human Services Vector Control Program announced today that a 61-year-old resident became the first confirmed case of West Nile Virus (WNV) in the city this year, and the department is urging residents to take precautions to avoid the spread of the virus. As of August 6, 35 cases have been documented in ten counties across the state with the case in East Long Beach being the only documented case in Los Angeles County. Since 2010, there have only been eight documented cases of the virus in Long Beach, with last year’s total of six confirmed cases being the high. The virus is spread through the bites of infected mosquitos. Symptoms of being infected can include fever, rash, nausea, body aches, head aches or vomiting, although only about one out of every 150 people infected ever become symptomatic. Persons exhibiting these types of symptoms are encouraged to seek medical attention. The infected resident had no underlying health conditions and is “recovering well” after coming down with WNV symptoms. John Holguin, the city’s epidemiology program director explained that having existing health issues can hamper the recovery process or even lead to the development of a more advanced and deadly form of WNV. An elderly resident died last November after being hospitalized due to complications associated with being invected with the virus the previous month. 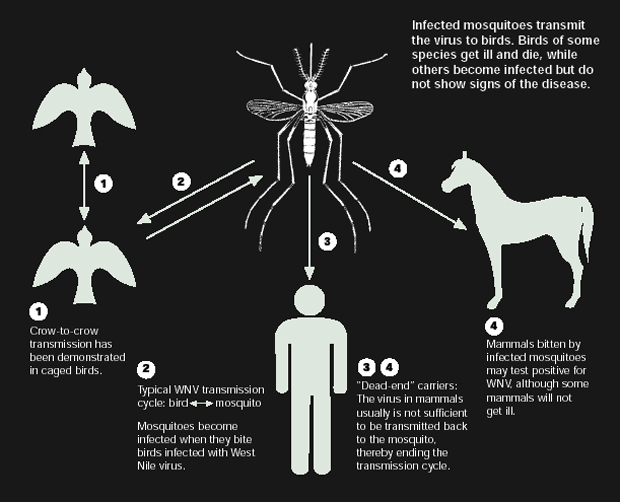 The last death in the city attributed to WNV prior to the 2013 case occurred in 2004, the same year the virus hit its peak on the West Coast. The combination of the summer weather and severe drought conditions in the state have made for ideal breeding conditions for mosquitos. The absence of rainfall allows what little water is pooled up in gutters or lawns to remain stagnant, explained Holguin, so the city is advising residents to limit watering lawns and outdoor plants to help combat excess water and runoff. Although there are few documented cases annually in the city, the disease is surveilled year round so researchers can keep tabs on when a potential problem is about to arise. Holguin said that mosquitos and dead birds are collected year-round, with the dead birds being tested to see if WNV was the cause of death. “When we have that activity, we take it very seriously because we’re looking at the possibility of it happening in our jurisdiction,” Holguin said. Wear long-sleeved shirts and long pants at dawn and dusk when mosquitoes are most active. Use mosquito repellant containing DEET, Picaridin, or Oil of Lemon Eucalyptus. Residents should follow repellant instructions on the label. Consult with your child’s pediatrician for appropriate concentrations of DEET to be used on children under the age of two. Maintain all swimming pools in a clean and sanitary manner, with all circulation and filtration equipment operational and chemical levels within recommended guidelines; drain water from pool covers. Limit the watering of lawns and outdoor plants to twice a week to avoid run off to gutters and around sprinklers. Do not over water plants or lawns to avoid creating pools of standing water. Report dead birds and dead tree squirrels to the California Department of Public Health by calling 1-877-WNV-BIRD or online here.